Welcome to the latest installment of Kickass Fictional Ladies, our ongoing series highlighting some of our favorite female characters from literature, film, television, and anywhere else we may find them. The Red Menace started us off with an atypical princess, Tiny Doom brought in one of the lead characters from a space Western, and Smalerie reminded us that anime can produce truly kickass ladies. So now it's my turn to shine the spotlight on a deserving character. To the surprise of no one, my choice comes from the world of animation. 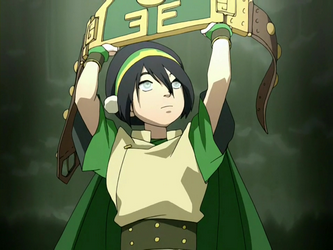 Introducing Kickass Fictional Lady number four: Toph Beifong. Where she's from: Avatar: The Last Airbender, one of the best television shows - animated or otherwise - of the last decade. The series is set in a fantasy world where people can use martial arts called "bending" to control the four elements: water, earth, fire, and air. The protagonist is twelve year old Aang, who is both the last surviving airbender and the legendary Avatar, capable of mastering all four forms of bending and charged with maintaining balance in the world. Avatar is an amazing series combining many of the best elements of eastern and western animation and a goldmine of kickass fictional ladies to boot. 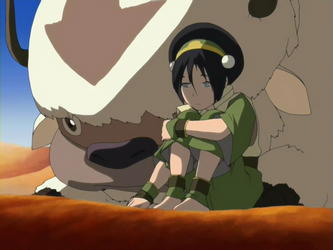 I had plenty of compelling ladies to pick from, but Toph is the one I can't seem to stop raving about. What's her deal: Before Toph joins the main cast of the show, she's living a double life. By day, she's the sheltered only child of a wealthy family, so sheltered that most people in her hometown don't even know that she exists. But by night, Toph sneaks out to earthbending tournaments, battling and defeating opponents several times her size. Desperate for the freedom that her parents are never going to give her, Toph runs away with Aang and his friends to become Aang's earthbending teacher. Why she's kickass: She's a twelve year old girl who can drop boulders on her foes. That alone should be enough. But did I mention that she's blind? Yup, all of those musclebound, wrestler-like earthbenders Toph competes against have their butts handed to them by a twelve year old blind girl. Toph's earthbending abilities give her a kind of radar sense that she uses to perceive the world around her, rather similar to how Daredevil gets around. But it's not foolproof. Toph can't "see" clearly or at all when she's not standing on firm ground. The result is that Toph's blindness feels like a real part of who she is, but not her entire identity. If the ability to turn a female character into a male one without having to change too much is one indicator of a strong female character, it's one that Toph can easily claim. The earthbending teacher character was originally going to be male before the show's crew decided that a petite girl earthbender would be more fun and interesting than a typical tough guy. Toph is physically strong, a natural fighter, and kind of a slob when it comes to personal grooming. Yet one of the potential problems with creating strong female characters is when the creators are so afraid of making the character seem too weak or too feminine (which are in no way, shape or form the same thing) that they end up making the character flawless, genderless, and completely boring. Happily, Toph is a fully realized character, capable of making mistakes and being hurt both physically and emotionally. Her desire to prove her self reliance and tough teaching style initially put her at odds with Team Avatar. She does relent to engaging in some girly activities with Aang's waterbending teacher Katara at the appropriately named Fancy Lady Day Spa, only to be teased about her newly made up looks by some of the locals. Toph's initial response is to dunk her tormentors in the river, but afterwards, she can't help showing that their words have hurt her. 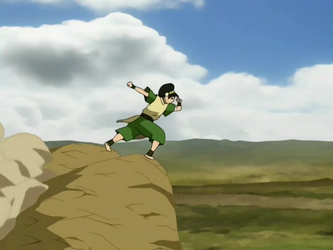 Oh, and Toph also invents an entirely new form of earthbending, because she's just that good.